Avoiding falls is key for people managing degenerative bone diseases like osteopenia and osteoporosis, and improving balance and muscle strength are both necessary to help protect brittle bones from being damaged. A study in Clinical Rehabilitation found that practicing the ancient art of tai chi, a series of controlled continuous, sequential movements, might decrease the risk of falling in postmenopausal women with osteopenia. Osteopenia is a precursor to osteoporosis, the degenerative bone disease in which bones lose bone mass and become fragile. Because of this, hip and spine fractures are common for those with this the condition, with falls being a large part of the risk. Even if a woman's bones are extremely frail, she may not suffer a fracture if she can avoid falling. 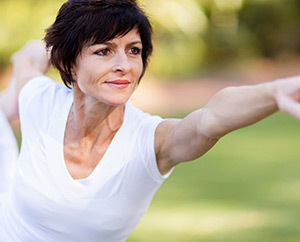 In this study, 61 senior women with osteopenia were assigned to a tai chi or control group. The tai chi group engaged in three, 60-minute tai chi sessions each week for 24 weeks. Women in the control group didn't receive any exercise training. The investigators measured the women's balance, gait, muscle strength, quality of life, and degree of back and hip pain before, during, and after the study. By the end, women in the tai chi group had a significantly greater stride width (thought to translate to greater stability when walking), and significant improvements in general health, vitality, and bodily pain. There were no significant differences between the groups regarding muscle strength, hip and back pain, and balance. The idea of exercising makes many seniors justifiably apprehensive, particularly about falling. However, if done safely it’s worth the effort as exercise is what most people living with weakened bones need in order to lessen the chance of falling and to help build more break-resistant bones. Anyone managing their health should always check with a doctor to plan an appropriate exercise program. Here is a simple exercise that may help develop better balance while strengthening your leg and core body muscles. You'll need: a medium-sized inflatable rubber or plastic ball. Partner up with a friend and stand on one foot with your knee slightly bent. Gently toss the bag/ball back and forth between you. As you master this, ask your partner to toss the bag/ball in different places, in a half circle between 9:00 and 3:00 o'clock. You can also do this exercise alone by tossing a ball against a wall and catching it.